Had to hunt for an automatic car wash. 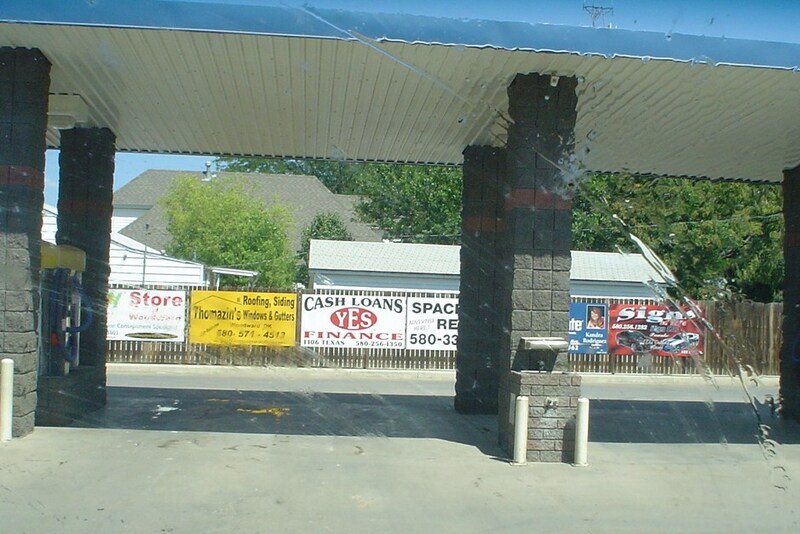 The gas stations in Arkansas and Oklahoma don’t seem to do car washes like they do in Tennessee and Georgia. Don’t know if they think their car aren’t dirty or if it doesn’t matter that they are dirty. Back East, a clean car is an important personal statement and I like a clean car. Anyways, found a self service car wash and they had one bay that was an automatic wash for $7. While sitting in the car while the equipment did all the work, I found it interesting that some of the local businesses were enterprising enough to put up signs on the fence. If you have to sit for a few minutes and be a captive audience, then reading their signs gives you something to do and I think it was pretty smart to put up the signs. I bet they got the idea from the signs along the outfield at the baseball fields. Tried to get all the honey-do chores done today in time to catch the “Ice Road Truckers” on the History Channel tonight. At 7:00 is a re-broadcast of last week’s season premiere, and then at 8:00 is the new show of the series. I’m totally hooked on this show. I am fascinated that these men take their lives in their hands to drive trucks over the frozen rivers and frozen ocean in the Arctic. They are modern cowboys with true grit.